You may have heard that you can now view Leonardo Da Vinci’s Last Supper online at extremely high levels of detail – 16 billion pixels! This makes it the highest definition picture ever (allegedly). One of the reasons for doing this is that the picture is deteriorating as do many paintings on plaster (it is not actually a fresco as it was painted on dry plaster). It is housed at the Church of Santa Maria delle Grazie in Milan where it was completed in 1498, and only 320k visitors a year can see it (to ensure its deterioration does not increase). The picture has had a frankly amazing life and survived some bad renovations, a bombing in the second world war, a door being built through it, and the fact that it has naturally deteriorated very quickly. 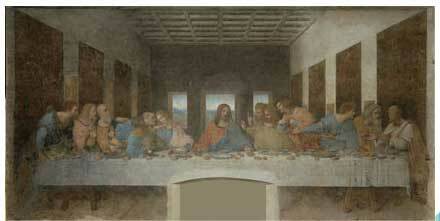 Now of course it is being maligned by spurious hoax theories such as the Da Vinci Code. The Last Supper is a fascinating picture and shows the reaction of the apostles when Jesus said one of them would betray him (Luke 22:7-38). I’ve read the passage before of course, but thinking of how Leonardo must have tried to picture the scene really helped it to come to life for me. I’ve been in difficult and tense meetings at work, but the last supper must have been the ultimate in difficult situations. Firstly Jesus made it clear that He was imminently going to killed, and whilst He had warned them of this in the past I’m not sure they truly believed Him. As if that was not enough he drops the bombshell that one of the disciples will be a key instigator in His death! What struck me is that after questioning whom it may be that will do the deed, their attention turned to which of them was the greatest. Perhaps they felt that by proving they were the greatest would prove they could not be the betrayer? Regardless, they showed in the space of a few minutes the amazing aptitude man has to turn the focus away from God and onto themselves. How can you be trying to outdo each other when the man you believe is the messiah has said this will be His last meal? How can you focus on your own strengths and weaknesses when God is in your presence? This is challenging as I am sure we all know how. We are all weak and sin. Yet by the grace of God he does give us strength and loves us despite our weaknesses. I pray that God will give me the strength to focus on Him and not loose my head and be distracted as the disciples did in Da Vinci’s The Last Supper. At the website you can also see a behind the scenes video and an interview with Alberto Artioli the Supervisor of the Milan Landscape and Architectural Association. You produced great concepts here. I done a study on the matter and learnt practically all peoples could concur with your blog. One of the much more extraordinary actions to take would be to change the ceiling of your room.